Foes of single-payer universal healthcare frequently pander the issue of access to life saving treatment being determined by some government death panel. Actually, that's what we have now, at least for the poor. Arizona eliminated transplants for Medicaid patients recently. After a firestorm of criticism coverage was restored, too late for at least one person who died for lack of a needed transplant. More often though, the bureaucrat making life-and-death decisions is in the employ of a private insurer. 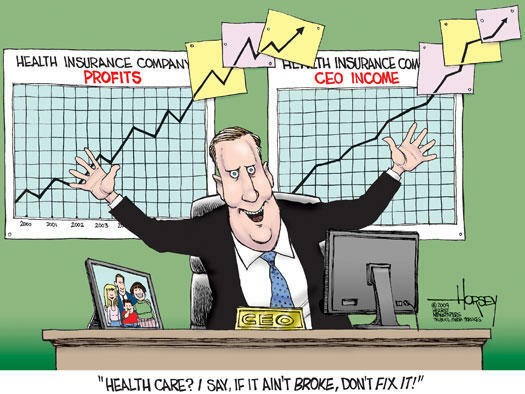 Private insurers are corporations driven exclusively by the profit motive. Their incentives are to maximize what they charge for coverage while minimizing services rendered. Every claim denied means more dividends for stockholders. How's that working out? Health insurers are making record profits even as patient outcomes trail those in other countries with single-payer systems. The bottom line is that healthcare access is determined by wealth, not by need, and it always will be until the distorting incentives of for-profit healthcare are removed from the system. If you think need, rather than ability to pay, should determine access to healthcare then you de facto support healthcare as a fundamental human right, just as Panderbear does. Unfortunately, in the United States, poverty kills. That fact should be an embarrassment for the richest nation in history. Also, Medicaid this year stopped providing Your way would have shoes for someone with polio. Polio is off some kind of a list. So one person needed to get help from the New York Times Neediest Cases Fund because the shoes cost almost $600. The fallacy in what you say is you assume that government won;t want to save money. Governments *always* to save money, even if it takes a few years. And what does saving money mean? Death panels of course. It's inevitable if the government is the main health care provider. In that case maybe even money wouldn't help, although political influence might, but political influence is scarcer than money. When a private business does this they get criticized by politicians and are also afraid of bad publicity and new laws and regulations. This is not true for a government program. You need to go back to the drawing board. Your way would still have access to health care being determined by money, only more so, - and if any limitations were put on the ability of money to help, then political connections or the ability to get into the newspapers and make a stink and soon, and that would also be an alternative to money. Thanks for your comment. Panderbear thinks the term 'Death Panel' is prejudicial. What was proposed in the Affordable Care Act is a panel of expert advisors that would recommend what are current best medical practices and what treatments are ineffective. They would not sit in judgement on individual cases or pull the plug on grandma. The guidelines produced by such an advisory board would work equally well under a single-payer system to control costs and improve outcomes.